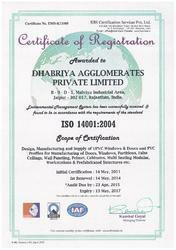 Dhabriya Polywood Ltd., An Is 14001:2004 Certified Company Was Established in The Year 1992. We Are One of The Prominent Manufacturers, Suppliers and Wholesalers of An Excellent Range of PVC Doors, Upvc Windows & Doors, False Ceiling & Wall Paneling, Decorative Fencing, Engineered Marble, Italian Marble, Artificial Marble, Designer Walls, Pillars, LCD Walls, Lift Jambs, Fire Places, Modular Kitchen Shutters, Modular Furniture. This Range Is Highly Valued for Its Excellent Quality, Rust Resistance, and Fine Finish. We Also Customize This Range in Terms of Sizes, Shapes, and Designs. Offered in Distinct Colors, This Range Is Highly Effective Against Dust, Humidity, Cold, Noise, Insects and Extreme Weather Conditions. Owing to Their Impeccable Finish, Thermal Stability, Dimensional Accuracy, Resistance Against Termite & Corrosion and Durable Construction, These PVC & Upvc Products Are Highly Appreciated Among Our Customers. For Meeting the Precise Needs of Our Customers, We Have Established a Huge Infrastructural Facility and Appointed a Team of Skilled Professionals. As Per the Specifications, Designs and Sizes Provided by The Customers, The Offered PVC Doors, Upvc Windows & Doors, False Ceiling & Wall Paneling, Decorative Fencing, Engineered Marble, Italian Marble, Artificial Marble, Designer Walls, Pillars, LCD Walls, Lift Jambs, Fire Places, Modular Kitchen Shutters, Modular Furniture Products Can Be Customized at Our End. Being A Quality Conscious Organization, We Assure That the Premium Quality of The Products Is Never Compromised. We Welcome Queries Across India, Our Branch Offices Available in Jaipur (Head Office), Ahmedabad, Kolkata, Mumbai, Bangalore, Chennai, Coimbatore, Delhi Etc. Spread over a wide area of land, we have set up a huge infrastructure that is well-equipped with latest machinery and equipment. To ensure that all the on-going processes are carried out in the most streamlined manner, we have carefully segregated our infrastructural facility. Our company stands on solid foundation of ethical trade practices. Owing to our strong business ethics and uncompromised quality standards, we have established long-term relation with numerous esteemed clients worldwide. Moreover, to retain the loyalty of clients, we provide up to the mark customized solutions to them. The final product range is packed as per the specifications of clients and is delivered within a maximum period of 10 days to the clients. “The Economic Times Business Leaders of Rajasthan Awards-2017 for ‘ENVIRONMENTAL PROTECTION & CONSERVATION’. at a glittering ceremony held on 26th July’17. 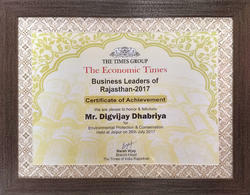 The awards were organized by The Times Group. Backed and supported by a team of skilled professionals, we have been able to attain a commendable position in this domain. Eye for details and commitment towards work, of our professionals has helped us in attaining a huge clientele across the nation. 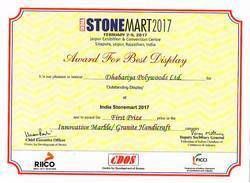 “The Award For Outstanding Display At STONEMART-2017 for ‘MOST INNOVATIVE MARBLE/GRANITE HANDICRAFT’. Infrastructural facility and skilled professionals has helped us in meeting the precise needs of our patrons in the most efficient manner. Custom centric approach and ethical business polices, has helped in attaining commendable position in this domain. The total quality management and customized solutions are assured, to attain maximum customer approval and satisfaction. Keeping the ease of our patrons, we accept different modes of payment such as cash, demand draft and online.